Yet another perfect weather day greeted a reasonable crowd at Bellevue Hill for this local CAS derby. The Cranbrook team was enjoying a good reputation, as tenacious, young and keen to really give its neighbour a touch up. The Waves were keen to ensure this game did not slip away and keep its momentum building for the finish to the season. Both sides had key players missing, notably, Tilley for Cranbrook and Moretti for the Waves. Cranbrook opened proceedings with some very solid defence thwarting the Waves attacking flair, applying pressure which resulted in numerous handling errors. Hugo Hayman no 1 and Alex O’Reilly no 8 for brook were standouts in aggression. It wasn’t until the Waves no 10 hit the line hard and used his brut strength that the Waves finally punched a whole,10m out from the Brook line that they scored. What followed next from the kick off was another Waves handling error giving Cranbrook a great positional opportunity to hit back. This they did when Cranbrook no 11 Peter North scored a good try in the corner, after many sets of line attacks, this was superbly converted by no 1 Hayman from the sideline. 7-7. The game then became bogged down with whistle blowing and what followed was penalty after penalty, until finally the Waves received 1 straight in front which the took and converted. It was now half time and the score Waves 10- Cranbrook 7. As the game restarted the Waves camp was hoping it would click into gear and start executing his movements, conversely the Cranbrook team clearly felt that an upset was about to happen. To their credit, what followed was a kick and chase by brook, and a nice bounce saw no 13 Taylor score for the men in red, white and blue, it was not converted, and brook now led 12-10. This score remained as is for the next 15 mins as the Waves continued to press but could not make the last pass stick, the crowd could sense an upset. Following yet again were many more stoppages and penalties, the Waves eventually slotted over 2 penalty goals and finally a great solo try to Hutchinson-Walters, who ran 50m and scored in the corner. The score now 21-12, and this would be the final score for the day. Unfortunately the game never really got going, too many stoppages and too many mistakes, primarily by the Waves. The game today was highlighted by an extremely determined Cranbrook team who almost caused a boil over. The execution by the Waves was poor, in particular bad handling and line out throws, but they managed to scrape home. All credit to Cranbrook, they have a young team with 11 year 11 boys, so they will be a real force next year. 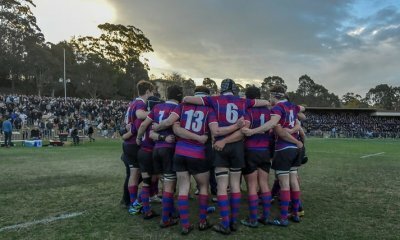 Waverley now faces the RED juggernaut ,Barker, next week at Queens Park, and unless much changes, they will get thumped. Best for Cranbrook were no 1 Hayman, no 8 O’Reilly and no.10 Pakutoa. Best for the Waves were no 10 Hutchinson – Walters, no 9 Thorn and no 6 Murphy. With the mid term break and more importantly the National schoolboy champs behind us, it was time for the CAS rounds to continue. Barker were the favourites coming into the game, with all rep players fit, while Aloys too had their top team on the park ready to rumble. Barker has always respected Aloys, as they are a team that really scraps hard and makes life very difficult for their opponents to establish and play their game. Today was to be no different. For the opening 15 minutes, both sides went at it. The Aloys forwards were not having a bar of the feared reputation of the Barker forwards, with Spaulding (2) and Rahme (8) providing plenty of clean ball to a Aloys back line that was looking sharp. Di Sano 9 was quick to the breakdown and his service to Pollack (10) & Spalding (12) meant that the Baker lads got plenty of tackling practise. For Barker ,Luke Weymouth 7 was everywhere, providing plenty of starch defensively and ensuring that the Aloys lads never really converted their mountain of possession into points. When Barker did get the ball though, things happened quickly. A break by Aust schoolboy squad player Dring (4), opened up space for Tejcek (9) to link with Graham (13) who with only Westbury (15) from Aloys to beat, drew his man and put Capt Tejcek in for the first try of the day. Nercessian added the extras and Barker lead 7 nil. Aloys hit back immediately with Partington (5) and Price (6) doing excellent work to put phase after phase together to put Rahme (8) over out wide. The conversion was wide and the game was on at 7/5. With the game anyones to win, both teams upped the intensity, which unfortunately bought the man with the whistle into the game. Both sides gave away technical penalties which slowed down the game and ate into the time clock. Frustration was evident and after what seemed a decisive break by Collison, the ref found issue with the something and issued a yellow card to Barker. With the line in the sand drawn by the ref, both teams got on with it, playing entertaining rugby but with no net result. With half-time approaching, it took a break by another of Barker Aust schoolboy squad rep, Billy Pollard (2) who put Bryden (11) into space who when again facing Westbury (15) found Tecjek (9) in support who crossed for his second of 3 tries on the day. With the extras Barker lead 14/5 at halftime. Barkers dominance this season is due in a large part to their fitness, as their 2nd half efforts against Kings and Trinity attest. Aloys were competitive in the first half as they were able to get clean fast first phase ball and recycle the phases. In the second half, Barker size and skill advantage became apparent. Two consecutive massive tight head scrums by Barker put any thoughts of a Aloys upset to bed. With Reimer (8) pealing off the back of an attacking scrum he found Kitchener(15) who with a nice step and deceptive speed crossed for Barkers 3rd try next to the sticks. At 21/5, and with injuries creeping into the Aloys side, the points came easily to the mighty Reds.Further tries to Tejcek, to make it 3 on the day, Nercessian and a 2nd to Kitchener put the result beyond doubt. Fulltime score Barker 42. St Aloysius 5. Shore travelled to Parramatta to try and topple an excellent King’s side who would have to be favourites after Scots GPS Premiership. Kings had come away with a strong win when the sides had met in the preseason trial, however, Shore had managed to stick in the game for quite some time and, with a solid win over Cranbrook in the holiday break, would be confident of being competitive for periods of the game. The struggle for Shore was always going to be containing some of King’s stars coming off the back of strong representative season form. 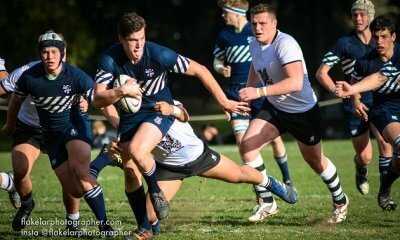 Shore, as they have done throughout the season, started off the first half reasonably well, managing to keep King’s scoreless for the first 15 minutes of the game and nearly sneaking a try of their own. However, a good period of sustained pressure saw the King’s forwards rumble close to the line before bursting over for their first. This was soon followed up from a bit of brilliance from Connolly. A poor Shore exit failed to go out and, receiving the ball on the halfway line, Connolly sniped straight down the touchline stepping numerous Shore defenders before getting the ball away to his winger to put it down out wide. Connolly would again be instrumental in King’s third and fourth tries, putting in a kick and chase that was scooped up and dotted down out wide for King’s third and getting a short ball on halfway from Suaali to jet through the Shore defence and score under the sticks almost untouched for King’s fourth. 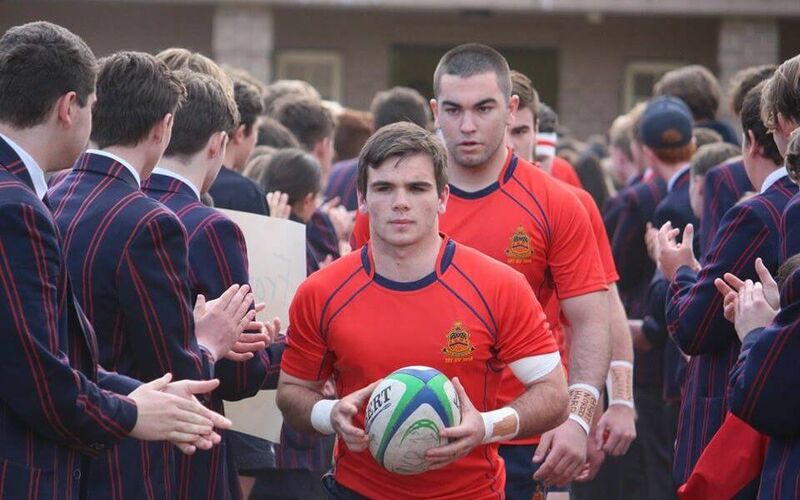 King’s 12, Penisini, would then round out an extremely dominant half for King’s, collecting the ball around Shore’s 10m line and storming through Shore’s defence for a good individual try. Half-time couldn’t come soon enough for Shore and it appeared the only way they would be able to deny King’s was to hold onto the ball at all costs. For King’s this appeared like a training run and they would be keen to grind Shore into the dust after half time. Unfortunately for Shore the second half started in much the same way as the majority of the first half, a strong kick chase from King’s put Shore under pressure from the restart before some messy handling saw Minogue pounce on a loose pass and trot in an all too easy try. At this stage, it was looking like it would be a very, very long second half for Shore. 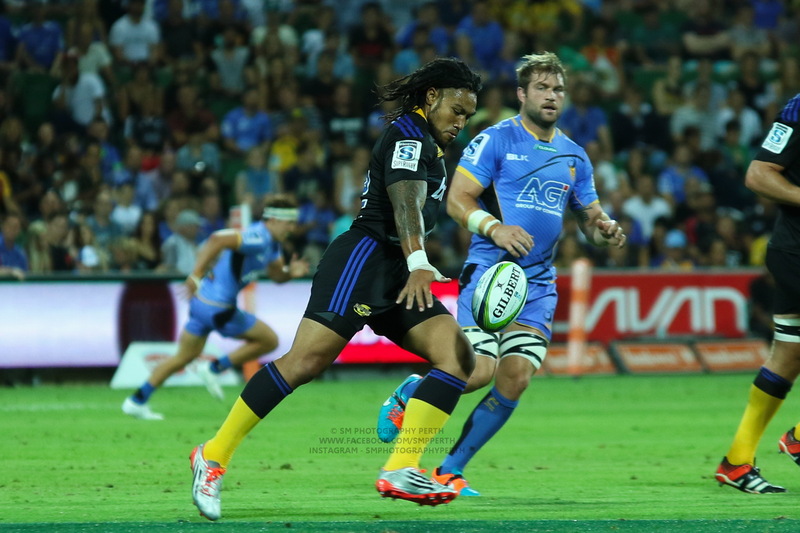 King’s not only punished Shore on turnover ball but also applied pressure on Shore’s set piece throughout the match. A good jump at the back of the King’s lineout saw them steal possession around the halfway line and a bollocking run from the second rower setup King’s 6 to crash over all too easily. Suaali, who had combined well with Connolly all match, then benefitted from a classic Connolly run. Receiving the ball on Shore’s 22 on the back of a Connolly break he jetted away to touch down for another easy try. King’s would then go in again through a nice interchange of passing down the touchline. Shore’s only joy came midway through the second half from a bit of individual brilliance from winger Digby Cooke who regathered his own kick for Shore’s lone try. The match finished at 64-5 but King’s, for all their dominance, probably could have scored another three or four tries. Connolly looked to be on a different level at many points throughout the match, his ability to step at full flight is rare at a professional level let alone in schoolboy rugby. Penisini at 12 was too strong and powerful for Shore too contain for much of the match and, not in his final year, will be a contender for higher representative honours in the future. Perhaps not as distinguished as some of the Scot’s pack, the King’s pigs nevertheless set an excellent platform for their lethal outside backs. It was hard for any of Shore’s players to really standout with their backs against the wall for much of the game, Digby Cooke’s chip and chase stood out as the lone highlight for the men from North Sydney. King’s will take confidence from their dominating performance but will of course come up against much sterner tests in the later rounds. For Shore the unenviable task of Scots at home looms. None of the Season’s top contenders were to meet in the first two Competition rounds, so this match, played away at Riverview, was viewed as a “danger-game” for Scots. It proved not to be, with Scots building an unassailable lead into halftime oranges, and despite giving ground to a more focussed ‘View in the second half; Scots ran out comfortable winners 42-17. Right from the get-go, Scots started building possession and phase-ball pressure, and a Scots’ tighthead win in the first scrum of the game, spoke of a long day ahead for the home pack. In a thrice, Scots’ inside centre, Kobe Rugless(12), was over the stripe to open the scoring; ably converted by custodian, Jack Mossman(15) for a 7-0 lead. 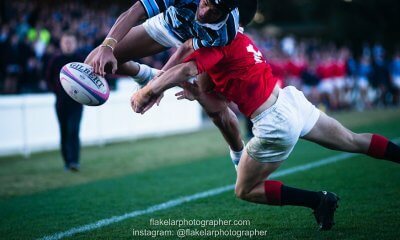 Short-ball mid-field darts by Scots front-rowers Hugo Patterson(1) and Nick Wingrove(3) were either keeping the Blue & White forwards at sixes and sevens, defensively, or were opening up Scots’ backline to press attacks. Tries to Lachlan Mason(10) and right-wing Ben Zucchiati(14), both converted by Mossman(15), had Scots in control just after the quarter hour mark, up 21-0. Through representative stars Angus Bell(10) and Dominic Easy(12), ‘View tried to gain field position and build some sort of pressure, but Scots’ D was assisted by numerous Riverview dropped balls at crucial moments. Fine team support play in the lead-up had Scots’ halfback, Seb Strang(9), amble over for Scots’ fourth try of the half, presenting Mossman(15) with his first easy conversion kick. Riverview’s second half opened much more brightly than the first, with the whole team showing greater intensity to the task and pressuring Scots’ mid-field and goal-line D.
An early try to ‘View’s flyhalf Angus Bell(10), followed soon after with superb finishing by right-wing, Hamish McDonald(14), gave the drum-beating home cohort some glimmer of an unlikely comeback. But having absorbed 15” of near to continuous opposition possession, Scots dialled up their own pressure through a dominant scrum, fairly marching the ‘View forwards off their own ball. That they backed that up with strong defence across the mid-field, pressed the Riverview ball carriers. A Brett Wellington(6) break sparked Scots’ first attacking foray well into the second half, and effervescent Lock, Toby Gavin(4), went in brandishing a smile as wide as the Harbour Bridge. A bit of a dirty day of handling errors for the otherwise skilful Riverview backs, was ended with an exchange of late tries; first to Scots’ Seb Strang(9) and then to ‘View’s Matthew Dutaillis(15) on the last play. Off straight lines of in-your-face defence, steady as the Rock of Gibraltar scrums, and sparkling backline movements and support-play, Scots built a match-winning first half lead. But as Newington did to Scots in the opening round, Riverview fired up in the second half to show far better what they are capable of without ever threatening the game result. Next up Scots host Shore, and Riverview travel across to Stanmore to see if they or Newington will break their Season duck. But most Round 3 interest will be at Hunters Hill, when an (only just!) undefeated Joeys host an undefeated Kings. Mmmmm. 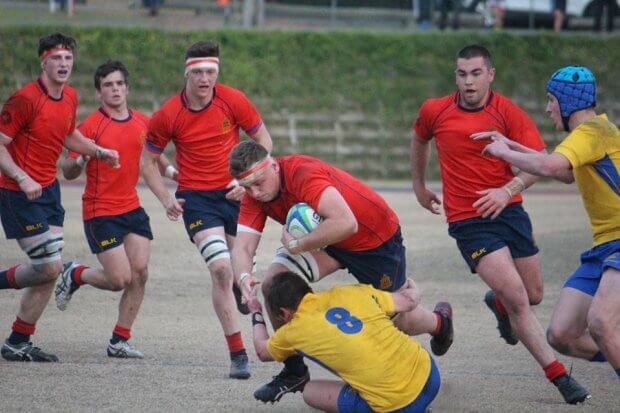 Scots lost EVERY game against Joeys. Methinks their investment is in imports. It seems its the only way Scots win premierships. Scots came 3rd in the GPS this year!